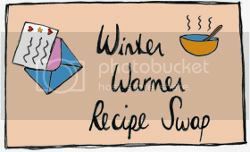 Have you joined the Winter Warmer Recipe Swap that Fiona and I are organizing? There are 8 days left before the sign-up deadline and I would love for you to take part! It's all about exchanging your well-loved recipes with other people who like to cook. When you write down a recipe for somebody else, do you get all artistic? I for one always try and add some kind of doodle or a fancy font. I'm not in any way artistically inclined, but I like to personalize recipes that way. There is an awesome website called They Draw And Cook. It is full of illustrated recipes that are very much artistic and I love to browse it just to look at the amazing designs. I chose some of the images I found there to serve as inspiration for the swap. Of course you don't have to get fancy at all, a lovingly handwritten recipe is enough in itself, so let these awe but not intimidate you! I love these pictures so much! Still not sure what I'm going to do for my recipe (depends slightly on my swap partner I guess), but these pics are so inspiring! My favourite ones: pavlova and super tomato soup!